Traditional Cambodian (Khmer) wedding ceremony was a really unique experience to witness and photograph. The wedding day included 5 main ceremonies, and 5 traditional Cambodian outfit and hairstyle changes. Traditionally, Cambodian (Khmer) wedding consists of ceremonies and celebrations lasting three days and three nights. Cambodian (Khmer) wedding ceremonies are beautiful, colorful and vibrant cultural festivity, steeped in tradition and express a strong connection to family, love, giving and ancestral respect. packed with energy (and people). Family and friends come together to share in the celebration. 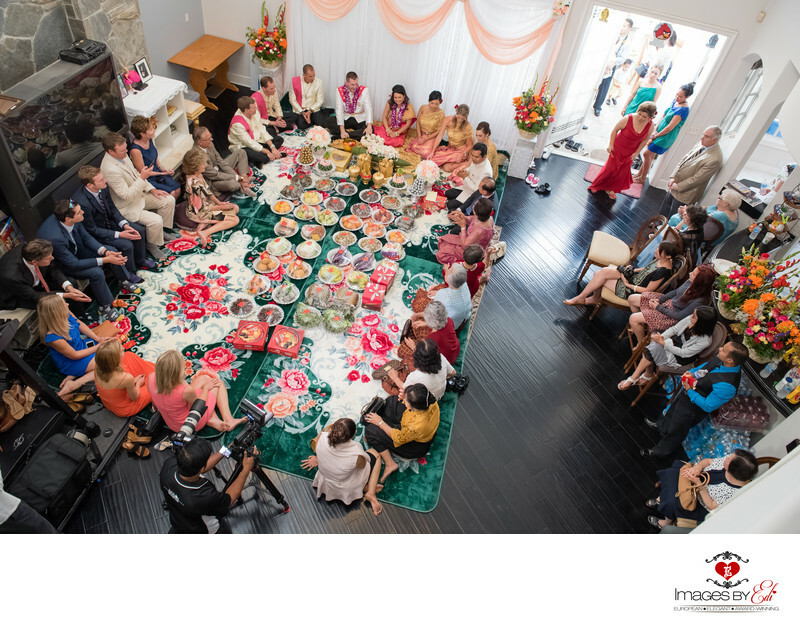 Due to the demands of modern day life, today in Cambodia and overseas, all the following wedding ceremonies are completed in one day.The couple's Traditional Cambodian (Khmer) multicultural wedding ceremony was held in the bride's Family Mansion in Covina, California. Cambodian weddings begin with the groom, his family, friends, and guests traveling to the bride’s home bearing gifts to the bride’s family as dowry. During the processional, the groom and his family walked together (parade) to the bride's parent's house with bearing gifts of wrapped platters of fruits and Khmer desserts as they made their way to the bride’s front door. The processional is a symbolic journey of the groom traveling to the bride’s house. The brides parents came out to greet the procession. The number of fruits and desserts were counted and found to be satisfactory, the mai ba and ma ha (representative for the groom’s party) run through a humorous verbal parlay, than they were welcomed by the bride and ended with the groom and the rest of the procession being invited into the bride’s home. Than the gifts were arranged on the floor in the center of the room, in front of the bride and groom. Than the Engagement Ceremony and Presentation of the Dowry took place. It is symbolized by the exchanging of rings (which would be similar to vows and rings exchange in the American tradition). During this time, the parents of the bride and groom engage in a discussion to ensure the couple will have a prosperous life together. This image was taken during this first ceremony.